Warm weather has arrived for most of us in the Northern Hemisphere. 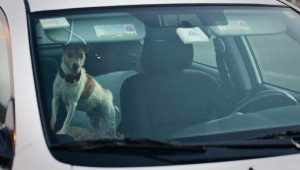 With the searing temperatures comes the inevitability of someone leaving their dog locked in a blisteringly hot car or letting their canine companion run around in a park during peak temperatures without access to fresh cool water. The outcome? Heatstroke, a potentially lethal complication an elevated body temperature from environmental exposure. In an effort to educate pet parents and hopefully help reduce the likelihood of a lethal accident, this week’s post is dedicated to the topic of heatstroke. Happy reading! Heatstroke – What is it? In dogs and cats, evaporation – in the form of panting – is the most important mechanism for dissipating body heat as the environmental temperature increases. 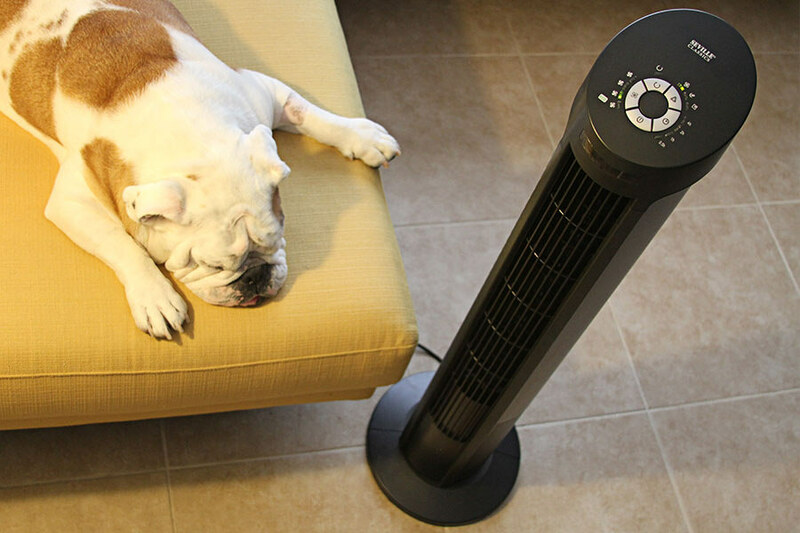 Placing a pet in front of a fan helps them rid their body of heat via convection. When core body temperature rises, blood vessels dilate. When this happens, blood inappropriately pools contributing to low blood pressure and a low volume state. Ultimately, cardiac output (the amount of blood pumped by the heart in one minute) decreases due to the reduced circulating blood volume, directly contributing to an inability to dissipate heat from the body. As heat in the body increases, various organ systems are compromised and fail to function, most notably the gastrointestinal tract, kidneys, blood clotting system, heart and lungs, and brain. Heatstroke is a life-threatening emergency that should be considered in any pet that presents with a core body temperature >104° F (>40° C) and has a history of environmental exposure. Normal cellular enzyme activity and cellular membrane stability are critically altered when body temperature rises to ³109°F (³42.8° C). Heatstroke – What causes it? Patients more often develop heatstroke during the summer months. Interestingly, the first few weeks of warm weather are often associated with a high frequency of heatstroke. Why? Pets haven’t had enough time to acclimate to the warmer (and often more humid) weather. There are also a variety of reasons that cause the body to produce excessive heat, most notably exercise and seizure activity. Heatstroke – How is it diagnosed? Don’t lock a pet in a hot vehicle. Photo courtesy of Mother Nature Network. Patients with heatstroke may have a variety of clinical signs, depending on how long with which they have been coping with an elevated body temperature. Some pets may simply pant excessively while others may collapse, have altered mentation, bruises, feel warm to the touch, and even have seizures. 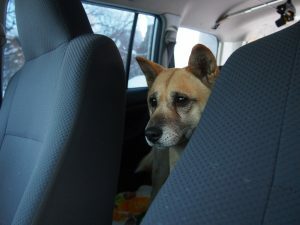 Upon arrival to a hospital, a veterinarian will thoroughly evaluate an affected pet. Physical exam findings consistent with heatstroke include an elevated rectal temperature, altered level of consciousness, brick red gums, increased respiratory rate and effort, and bruising. Blood and urine samples will be collected to evaluate major organ systems. Heatstroke – How is it treated? Whenever possible, cooling a patient with suspected or known heatstroke should begin cooling at home. The animal should be sprayed down with room temperature water before transporting to the hospital. Do not use cold water! Driving with the windows down and/or placing the dog in front of an air conditioning vent may enhance evaporation. A previous study showed an overall mortality rate of 50% in dogs presenting with heatstroke, but mortality rate was 38% in those cooled at home versus 61% for those who were not. As efficiently as possible upon arrival to a hospital, a veterinarian will provide the affected pet supplemental oxygen and external cooling. Pets will receive Intravenous fluids to ensure vital organs receive adequate blood flow Patients will be administered a broad-spectrum antibiotic and medications to support the gastrointestinal tract. Many patients require blood sugar supplementation for hypoglycemia, as well as a special fluid called fresh frozen plasma for blood clotting abnormalities. Pet parents may find it uniquely helpful to partner with a board-certified veterinary emergency and critical care specialist to help maximize the likelihood of a positive outcome. Heatstroke is a potentially lethal condition that arises when body temperature rises excessively due to environmental exposure. Organ systems fail and affected pets can readily die without timely and aggressive interventions. Thankfully heatstroke is entirely avoidable. Don’t exercise pets in hot temperatures. Ensure dogs and cats always have access to shade and fresh, cool water, and don’t leave pets in hot vehicles.